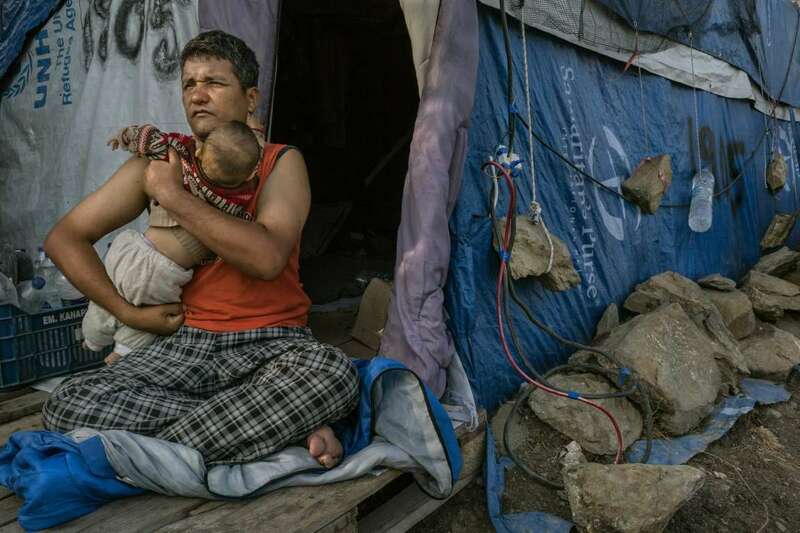 Rulam Heidari, 35, from Mazar-i-Sharif, Afghanistan, with his eight-month-old daughter, Firish, at their makeshift tent. The overcrowding is so extreme that asylum seekers spend as much as 12 hours a day waiting in line for food that is sometimes moldy. Last week, there were about 80 people for each shower, and around 70 per toilet, with aid workers complaining about raw sewage leaking into tents where children are living. Sexual assaults, knife attacks and suicide attempts are common. The conditions have fueled accusations that the camp has been left to fester in order to deter migration and that European Union funds provided to help Greece deal with asylum seekers are being misused. In late September, the European Union’s anti-fraud agency announced an investigation. At the height of the European migrant crisis in 2015, Moria was merely a way station as tens of thousands of asylum seekers — many fleeing wars in Syria, Iraq and Afghanistan — poured through the region on their way to northern Europe. Then, the numbers were so great, the migrants were effectively waved through. Gradually, European Union countries tried to gain control over the situation by closing internal borders and building camps at the bloc’s periphery in places like Lesbos, where so many of the refugees arrived. Now they are stuck here. Today, Moria is the most visible symbol of the hardening European stance toward migrants — one that has drastically reduced unauthorized migration, but at what critics see as a deep moral and humanitarian cost. Outside Europe, the European Union has courted authoritarian governments in Turkey, Sudan and Egypt, while Italy has negotiated with warlords in Libya, in a successful effort to stem the flow of migrants toward the Mediterranean. Inside Europe itself, those who still make it to the Greek islands — about 23,000 have arrived this year, down from 850,000 in 2015 — must now stay at camps like Moria until their cases are settled. It can take as long as two years before the asylum seekers are either sent home or move on. The group’s lead psychiatrist on Lesbos, Alessandro Barbiero, said he had never seen such overwhelming numbers of severe mental health cases. Of the roughly 120 people his team has the capacity to treat, the vast majority have been prescribed anti-psychotic medication. “Moria has become a trigger for an acute expression of psychosis and post-traumatic stress disorder,” Dr. Barbiero said. The International Rescue Committee, an aid group with a smaller presence on the island, said that just under a third of the 126 people its psychosocial workers have assessed at Moria since March have attempted suicide. The majority of the camp’s residents are Syrian, Iraqi and Afghan refugees, many of whom have suffered wartime traumas that are then exacerbated by the overcrowded and static conditions, which fuel their despair. As in Mr. Tamba’s case, few suicide attempts result in death, conditions being so crowded that they are usually discovered quickly, aid workers say. But the damage can be lasting — Mr. Tamba’s attempt scarred his stomach, which still pains him. After finally being identified as a vulnerable case, Mr. Tamba, who was said he was arrested at a political protest in Congo, has been allowed to move to another camp on the Greek mainland. But conditions there are not much better, and Mr. Tamba worries whether he will be able to access medication now that he has been moved. The Greek government says it plans to move a third of residents to the mainland in the coming weeks. The camp’s population in September was so large that many were living under tarpaulins on a windswept spillover site beyond its fences. Since 2015, the camp has often relied on smaller overflow encampments, but in five visits over the past three years, I had never seen the spillover extend so far. Rahmuddin Ashrafi, an Afghan farmer, arrived here in June with his wife, Sohaela, and their three small children. In Afghanistan, Mr. Ashrafi, 34, said their house and land were destroyed in fighting between the Taliban and the Afghan army. At Moria, the five of them now share a small two-person tent. The family’s typical day begins at 4 a.m., when Mr. Ashrafi joins a line for water and bread that is usually served four hours later at 8 a.m. At around 9:30 a.m., he joins the line again for lunch, which tends to arrive after another four hours of waiting. Two hours later, he joins another four-hour line for dinner. On the days when he needs to line up for official paperwork, or to visit the doctor — his three-year-old daughter was recently hospitalized with appendicitis — he sometimes has to skip meals altogether, or rely on leftovers from other Afghans. Few residents feel safe. In the privacy of his tent, a 25-year-old Iraqi student rolled up his sweatshirt to reveal a recent set of stab wounds. These were the result of an attack by other campers, he said, asking that his name not be punished for fear of further reprisals. Sexual violence is also common. The International Rescue Committee has assessed over 70 people since March who have reported being sexually abused at the camp. Women say they are wary of walking alone through the camp at night. Compounding these issues, many residents feel trapped in an endlessly bureaucratic asylum application process that they do not fully understand. Mr. Ashrafi had to miss a scheduled interview because he had to take his daughter to the hospital. Now he must wait months for another appointment. Those arriving at the camp in the coming weeks can expect to wait until at least March for an interview, said Philip Worthington, managing director of European Lawyers in Lesvos, a legal aid group operating on the island. Should an applicant be rejected, there are currently no state-sponsored lawyers to assist them with their appeal, in contravention of both Greek and European law, Mr. Worthington said. There is growing acrimony — and now an investigation — over why the camp is so bad when so much money has been provided by the European Union to help improve the Greek asylum system since migration levels started to rise in 2014. The European Union has allocated nearly 1.62 billion euros — about $1.9 billion — to the Greek asylum effort over the past half-decade, of which €1.1 billion has already been paid out, according to data supplied to The New York Times by the bloc. Over 20 government departments and nongovernmental organizations have received European Union money, a piecemeal approach in which no institution has complete oversight over how the money is spent. A spokesman for the Greek migration ministry, Alexis Bouzis, denied any financial misuse on the part of the government, and attributed the situation to a small rise in migration flows over the summer, which led to a backlog. “No one could have predicted it,” Mr. Bouzis said. Aid groups have been warning of a need for expanded facilities for several years, however. For some, the failure to improve the camp and hasten the asylum process suggests neglect on the part of the Greek government and the European Union departments that fund it. This perception was reinforced at a private meeting of Greek and European Union officials and aid workers on Sept. 4. According to two people present, a British official representing the European Commission, the bloc’s civil service, suggested keeping living standards low at Moria in order to deter future migration to Greece. Asked to comment on this suggestion, a spokeswoman for the commission said that it did not represent the service’s official stance.